Cancun comfortably holds the title of Mexico’s party capital but there is much more to this lively city than meets the eye. It is a place of beautiful contrasts with the glitzy hotels and white sand beaches; complimented with the effortlessly authentic salsa clubs. While venture out of the city a little and discover Mexico’s rich cultural heritage. Situated on the north-east tip of the Quintana Roo province, Cancun enjoys the calm waters of the Caribbean Sea lapping up on to its shore. The Latin atmosphere of Cuba is just across the bay, adding to the magic that comes with 2019 Cancun holidays. While the city may have a reputation for being a huge party destination, you can enjoy this lively destination no matter what group you’re travelling with. Cancun is an experience you will never forget with glorious weather, miles of white sand beaches and the bluest ocean you’re ever likely to see. Let’s find out a little more about this Mexican delight. Cancun’s reputation may precede it a little but the coastal city has so much to offer to every type of holidaymaker that arrives here. The main attraction is undoubtedly the hotel zone which is exclusively built around the area’s tourism industry. A host of high-end hotels line the promenade providing magnificent views over the Caribbean Sea. During the day, the beaches are packed with holidaymakers soaking up the sunshine on the beautiful white sand stretches of shoreline. The bars come to life with the sound of live music and DJs; however if you want something a little more refined then you can take a step back and explore this beautiful region. Embark on a day trip to the famous Chichen Itza. Widely recognised as one of the ‘New Seven Wonders of the World’ and registered as a UNESCO World Heritage Site, this pre-Columbian city was built by the Mayan civilisation. Its focal point is the unmistakable Temple of Kukulcan which towers over the rest of the area – if you’re visiting Cancun then this is an absolute must-see. When it comes to nightlife, don’t worry because Cancun has got you covered. The main port of call is the Hotel Zone, a slice of Las Vegas in Mexico. Here you’ll find a huge range of entertainers and DJs where the pina coladas flow all under one roof. There are a number of bars in this venue including Senor Frogs, Dady’O and Basic Discotheque Cancun all with their own unique charm. Head to downtown Cancun to enjoy the refined atmosphere of an underground salsa club or check out the clubs on Yaxchilan Avenue where you’ll party where the locals party. 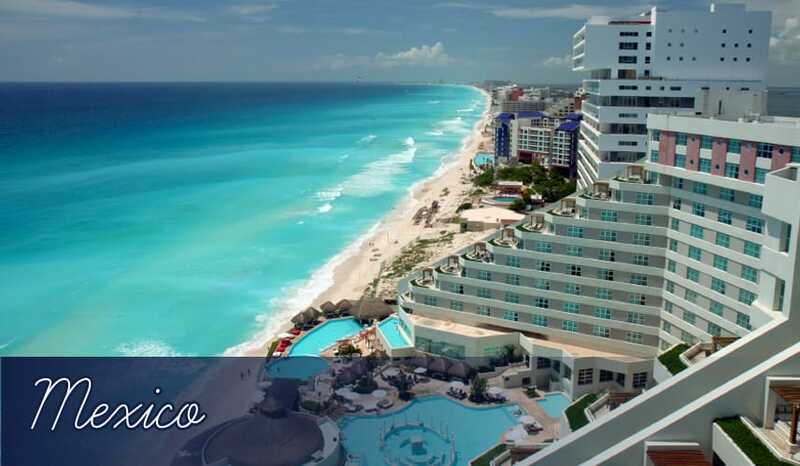 A holiday to Cancun is something you won’t be forgetting in a hurry. As one of the most popular destinations in Mexico you can have the night of your life and visit some of the most unique sites in the world. Not many holidays can compare to the atmosphere of Cancun. This can be the trip of a lifetime and sampling the culture of Mexico simply has to be tried and no matter whether you’re travelling as a couple or a group – you will instantly fall in love with Cancun. El Rey Ruins: Around 18km from the main tourist area on Cancun holidays, this small but enchanting site has a number of fascinating ruins. There are actually almost 50 structures here all built around 500AD, and funnily enough, there are hundreds of iguanas roaming around freely too! Yamil Lu'um: The smaller of the two Mayan sites actually within close reach during holidays in Cancun. You'll appreciate the wonderful views out to the Caribbean Sea as Yamil Lu'um is on the highest natural spot facing the endless mesmerising sapphire sea line. Chichen Itza: Although actually over 130 miles away from Cancun, we had to mention this site as it's well worth the 3 hour travel time deep into the Mexican rainforest. Many people travel to the site during their holidays in Cancun, so it should be quite possible to find excursions there. Expect to see awe-inspiring structures such as the imposing pyramid-like El Castillo, or the huge Temple of the Warriors. As Chichen Itza was actually once a Mayan city, there are many structures and even caves to see, all densely packed within an area of around six square kilometres. Truly an unforgettable sight you simply must visit on holidays to Mexico. It’s not just about partying in Cancun. While the city has an undeniable reputation across the world there are so many activities and attractions to see and do. From historical sites to natural wonders, there is a wealth of beauty in the city and surrounding areas that simply has to be explored during your stay. One of the must-see sites on the Yucatan Peninsula is the ancient city of Chichen Itza. Regarded as one of the New Seven Wonders of the World it is the largest Mayan archaeological ruins in the region. Book an excursion to this incredible remnant of the past and learn about the history of both Mexico and the Mayans. See the cenote where human sacrifices took place and take in the amazing views over the Quintana Roo landscape – one not to be missed. The Yucatan Peninsula is an absolute dream for snorkelers and scuba divers thanks to its proximity to the Mesoamerican Reef, the largest of its kind in the hemisphere. There are plenty of diving schools around Cancun which cater for everyone from beginners to veteran divers. Explore the paradise below the surface and an once-in-a-lifetime holiday experience. Take a break from the busy city life of Cancun and explore the surrounding areas. Isla Mujeres is only a 15-minute boat ride away and is perfect for a day trip. Embrace the Caribbean vibes on what will feel like your own private island. You can visit the former port of the Mayan empire – Tulum. The town is now a shrine to the civilisation with a pyramid perched on the edge of a cliff providing amazing panoramic views of the region. Cancun is also a major golf resort with around 15 world class courses in the region. Tee off on fairways which feature everything from cenotes, lagoons and Mayan ruins to jungles and sand dunes. The Riviera Maya is seen as a revered area in Mexican golfing circles with the El Camaleon Golf Club hosting the country’s only PGA Tour, the Mayakoba Golf Classic, since 2007. White sand and turquoise waters, what more could you want? Cancun may be one of Mexico’s favourite getaway destinations but you will feel like you’ve been transported to a Caribbean island on these pristine beaches. These can be your own little slices of paradise and whether you’re a fan of surfing, snorkelling or sunbathing there is a part of Cancun for you. The majority of beaches are found in the Hotel Zone each having their own unique qualities. One of the city’s most popular beaches is Playa Forum, a stone’s throw from the Coco Bongo nightclub. Here you can choose from soaking up the sun on the white sand or rubbing elbows with the stars at the Mandala Beach Club which looks out across the Caribbean Sea. While it may sit right next to Playa Forum, there is a totally different vibe to Playa Chac Mool. It is almost night and day as this laidback affair is perfect for having a lazy day by the ocean. You won’t find any loungers or umbrellas here but you will find a peaceful tranquillity not normally associated with Cancun’s party reputation. Strike a pose against Cancun’s own Hollywood-style sign at the city’s biggest beach – Playa Delfines. Here you can take in stunning views, paddle in the warm Caribbean waters and even visit some nearby Maya Ruins and, despite its size, is one of the quieter beaches in Cancun. Away from the Hotel Zone there is Playa Norte close to Isla Mujeres which is a perfect place to watch the sunset. What do you fancy eating tonight? Cancun has you covered. As you would expect from the biggest city on the Yucatan Peninsula, Cancun has a wealth of restaurants catering for every tastebud. Whether you want homecooked Mexican cuisine, succulent steaks, fresh seafood or just a couple of light bites – there is somewhere in this fair city to satisfy your hunger. If we’re talking Mexican food then look no further than La Habichuela. This is a Cancun legend and has been serving gourmet versions of Latin American classics for over 30 years. Situated in the former owner Armando Pezzotti’s home it is an amazing culinary adventure. You simply have to try their signature dish Cocobichulea which is a combination of lobster, shrimp, rice, curry sauce and tropical fruits – sounds good doesn’t it. Eat like the locals do at La Destileria in the Hotel Zone. Here you can chow down on an incredible set menu including traditional spiced corn soup followed by a sumptuous chicken dish. Wash it down with a margarita made from one of the over 100 types of tequila they have on site. There’s even a tequila museum next to the restaurant! Of course, if you’re after something a little easier and on the go then there are plenty of great value restaurants around Cancun. The Surfin’ Burrito is open 24/7 serving up delicious burritos, quesadillas and tacos with a beer for only a couple of pesos. Los de Pescado is one of Cancun’s hidden gems but it knows how to make a fish taco while The Alley (El Callejon) has some of the best hamburgers this side of Mexico. There are also a host of international restaurants dotted around the resort ranging from sushi bars, American steakhouse, Italian trattorias, pizzerias and everything in between. You won’t be stuck for choice for eating in Cancun. Cancun’s nightlife needs no introduction. The city has a worldwide reputation for its love of partying and the rumours are very much true. Thanks to the sheer abundance of bars and clubs you can create a night you’ll never forget. From the decadent superclubs to the swanky promenade bars to the secret underground salsa cafes – Cancun has the ability to continually surprise. The undisputed king of Cancun’s club scene is Coco Bongo. Located in the city’s Hotel Zone, it is the place everyone wants to be and be seen. Creating a unique experience every night of the week expect to see extravagant acrobatic performances, live performances from Michael Jackson impersonators, neon lasers and the very best hip hop, dance and pop music. If you’re going to go to one club in Cancun – make it Coco Bongo. Just a couple doors down from the craziness Coco Bongo is two more of Cancun’s favourite clubs – The City and Mandala. The Indian-inspired Mandala is one of the city’s coolest nightspots with an achingly chic vibe and a sprawling VIP area. The City is a different beast entirely and is Latin America’s biggest nightclub holding over 5,000 people. This is a Spring Break staple with the 3-storey superclub playing host to internationally known artists such as Flo Rida, 50 Cent, Snoop Dogg as well as different top name DJs each night. Other highlights around the Hotel Zone include DADY’O, a club which looks to have carved into the side of a cave, and Palazzo, the newest nightclub on the Cancun scene with wild theme nights. Of course, if you’re looking for something a little more refined then the city has plenty of places to chill out if you don’t fancy hitting the major nightclubs. Senor Frogs in the Hotel Zone prides itself on being a destination for the whole family with conga lines, balloons, confetti and general craziness being the order of the day. Kids can enjoy “virgin” versions of their famous cocktails in this festival of fun. If you’re looking for a slice of more authentic Mexico then the Grand Mambo Cafe is the place to be. Dance the night away to the rhythms of salsa and cumbia with live music every night of the week. You will feel properly immersed in both the Caribbean and Latin American culture. Being the cosmopolitan city it is there is a huge amount of choice when it comes to shopping in Cancun. From department stores, designer outlets and household brand names to the traditional boutiques selling local handicrafts – Cancun has it all. Another benefit of shopping here is that the city is a duty-free zone so you can save a fortune of souvenirs and other mementos. Close to the Hotel Zone is Plaza Las Americas, a one-stop shop for pretty much anything you’re looking for. This sprawling shopping mall is the largest of its kind in the city and boasts high street shops, department stores, restaurants and a cinema. Alternatively, there is Plaza Flamingo which is perfect for souvenir shopping. If you like your retail therapy with a little finesse then head to the La Isla Shopping Village on the Nichupte Lagoon. This outdoor shopping complex has over 150 national and international stores not to mention bars, restaurants and cafes. You will feel like you’ve been transported to the streets of Venice as you weave between canals and small bridges – it’s a shopping experience not to be missed. However, if you want something a little more authentic Mexican then stop by Market 28 – Cancun’s biggest flea market. Here you will be able to find unique gifts you won’t be able to get anywhere else in town, there are also a handful of bars and restaurants where you can stop off for a beer and a bite to eat.